This thought underlines John Paul II's message, following the Council invitation: “men need to be diligently educated to a more vast culture of the spirit." This expression seems to trace the experience of St. Anthony M. Zaccaria. Back home in Cremona, after graduating from the school of Medicine in Padua, he became aware of the need of moral values as the foundation for any orderly culture of life. With his catechesis on the Decalogue he was aiming at rekindling in the hearts of his fellow citizens the great moral norms which constitute not only the support of an authentic religious life, but also of the same social co-existence. The sense of disorientation and ambiguity Anthony Mary senses in his contemporaries was not different from today's reality. On one side he reprimands the facility with which indiscriminately "human opinions and inventions, like heresies, and man’s opinions" (Sr I, 74) are welcomed, and on the other hand the tendency to superstition which did not spare the very religious experience of the Christians who considered as miraculous the practice of prayer, fasting, and the sacraments (Ibid, 75) and even those consecrated, whom he reprimands for practicing a "superstitious prayer" (Ibid, 78). The basic moral principles, source of man's full truth, cannot avoid to refer to the Decalogue, so well eviscerated by Zaccaria of its Biblical, theological, and practical contents, repeating the invitation to "investigate very carefully your own conscience" (Ibid, 72; cf. 75,76), to find faster its "rot' (Sermon II). What is needed is to transform the Saint's catechesis into a healthy occasion to look for those "many things" (Sermon IV) which reveal themselves to whomever makes an unbiased reflection on his own conduct. Once "Shown ... the evil," we have to be the ones to search for "the way and the medicines" to heal it (Lettre III). There is no doubt that Anthony Mary wants to create a spiritual group which would adopt the evangelical beatitudes as its rule of life (Sermon IV). But before we aim at the extraordinary we have to measure up to the ordinary, "If you want to keep the law of Christ, it is necessary that you first keep the old law" (Sermon I), that is, the Decalogue. To reach the "freedom of the Spirit" (Anthony Mary had learned from his teacher, Thomas Aquinas, that the law of the New Testament is the same Holy Spirit! ), we have to make the effort "to keep first the Commandments" (Ibid, 76). Once the aim is reached, the Christian moves in the spirit of the beatitudes, which inspire not only religious life but also civil life, and not only personal but also social life. In fact, Anthony Mary affirms without compromise that if one should refuse to risk for justice, forgetting that the "blessed are those persecuted…," he "would not be talking like a Christian, rather not even as a good citizen" (Sermon IV). At this point the longing for a more responsible and profound spiritual life becomes urgent. The spirit, our Holy Founder says, is "the most precious talent" (Sermon II). To experience it (Sermon VI), to taste it (Sermon II) is the supreme good for man, to the point that if we will not have this yearning, the very observance of the Commandments will fail. It is like saying that the extraordinary is the salvation of the ordinary. Is this not the way we act also in life? One who wants to pass the exam is going to study more than the minimum needed or indispensable. A thought expressed by Anthony Mary in a phrase which has become lapidary "Whoever wants to avoid the danger of transgressing the commandments, must observe the counsels" (Sermon VI). 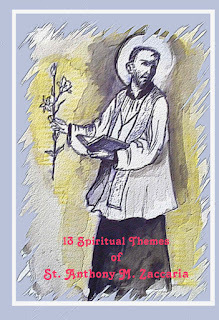 All the 13 Spiritual Themes of St Anthony M. Zaccaria were translated from Italian by Fr. Frank Papa, CRSP and edited by Ms. Fran Stahlecker.